More Aerial Drone Services Choose RTV for Virtual Tour Hosting! Our Northern Illinois Drone Service has been in business for about 6 months now. We recently joined the RTV Team after about 3 months of discussion. The delay was due to the fact that we are very focused on the commercial market in the Northern Illinois market. Although we do a lot of real estate photography and video, our target market is helping business market their establishments via ‘new perspectives’. Our services include general Photography, 3D Virtual Tours, Floor Plans, Drone Aerial Imagery, and Website Development. Most recently we add ‘Interactive Mapping’ to our service listing, whereby we provide an interactive map (either Google or image) and provide links to photos, videos, virtual tours, web pages, etc. We are currently developing these maps for cities, resorts, amusement parks, and stadiums. We had developed our own platform to compile different elements for our clients, however there are certain applications where the RTV virtual tour software platform performs perfectly. Hello RTV virtual tour providers! A Pre-shoot checklist holds immense value for the virtual tour photographer. It’s always a great feeling to walk onto a location for a real estate photography shoot and see that every detail your Pre-shoot Checklist has been covered. It makes the whole process go much smoother and leaves the brain free for creative thinking, and to pay attention to the technical details of the photo shoot. For any given image, the photographer has a myriad of tasks and details to be concerned with. Camera angle, diverging lines, composition, white balance, shutter speed, ISO, aperture, lighting, and the list goes on. With so many critical details to attend, it is easy to miss little things, like a wrinkle on a bed spread, the distracting floral arrangement that obscures a key element, or a bulb out in a hallway. A well laid out Pre-shoot Checklist is valuable because it will work to cure many of the repeat issues we see when shooting a property. I like to follow through with my agent to ensure that the home owner has in fact received a copy of the checklist. I encourage my agents to hold off on the shoot until all items on the list can be completed. The most frustrating thing for me for real estate photography, is showing up and neither the agent or home owner has ensured all bulbs are working prior to shoot time. Final thought on the value of a Pre-shoot Checklist. A good checklist, is another way to serve the client. It’s the first step in making sure the final product meets the expectations they have of you. The checklist is also another key part of relationship building with your client. So, in closing, I encourage my fellow RTV virtual tour software customers to dust off your checklist and see how you can use it to better serve your client and smooth out your shoots at the same time. The old saying “The only thing constant is change” applies to many things and the Google Street View | Trusted program is certainly one of them. 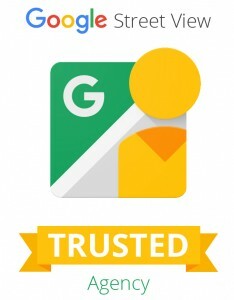 The Google Street View | Trusted program was started in April of 2010, in an effort to bring local businesses more attention in search engine results and increase the high-quality content that is served up in search content. Since that time Google has continually redefined the program including who can become a trusted photographer, what the final product will look like, and how it can be viewed. With each new announcement, photographers and the businesses they serve, are left to interpret what the changes mean, and do they increase or decrease the value of the final virtual tour product. RTV became a Google Trusted Agency in 2014 and added Google’s walkthrough style tours to the services we offer to businesses across the country. In a short year and a half, many virtual tour providers within the RTV network took the initiative to become T4 Certified, which enabled them to shoot Google style tours for RTV, as well as allowing them to sell Google tours in their local area. Hundreds of Google-style virtual tours have been completed for our national clients, in addition to the high-quality professional photography and interactive virtual tours that have been the mainstay of our Tour Track professional photography service for years. On July 19th, 2016 at 7:00pm est, Shawn Roach and Jay Stringham will be hosting an informational Tour Track national photography service webinar, covering the most recent changes to the Google Street View | Trusted program and how RTV as a company will proceed with the program in the future. If you are a veteran Tour Track photographer, a recent newcomer, or an RTV photographer who is considering shooting Tour Track jobs this year, we encourage you to join us. You can register for this webinar through your Fusion dashboard. We look forward to seeing you there. If you would like to order professional photography or a virtual tour please contact us for pricing and additional information. Our network of photographers spans across the US and Canada allowing us to deliver the high-quality imagery you need quickly and efficiently. If you are a photographer who is interested in offering virtual tours as a part of your business, we encourage you to start a free no-obligation trial account today. 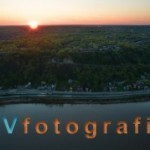 As a professional photographer and virtual tour provider you know the value of photography. Even Realtor.com in recent years has published articles clearly showing statistics proving that professionally photographed homes sell quicker and for more money. The issue photographers face far too often is that unless agents and homeowners see professional and amateur photos side by side, they don’t understand the difference. Many agents are under the impression that their cell phones and low cost point and shoot cameras are just as good as a professional camera in the hands of a professional photographer. It is up you the business owner, entrepreneur and professional photographer to convince them otherwise. The ability to effectively prove this point to multiple customers is too often the difference between a successful real estate photography business and a hobby that trickles in money here and there. 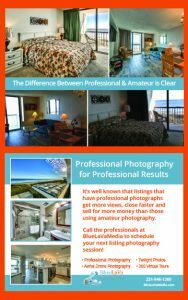 This month’s new RPM marketing piece addresses this issue head on With clear examples of professional quality photos and armature cell phone quality photos on the same piece, realtors will be able to see the difference and gain a new respect for the value that your photography service provides. This marketing piece, available to RockPointe Marketing subscribers, is a printable, high-resolution double sided piece with examples of amateur and professional photos taken of the same property. It is presented in a Photoshop file allowing for complete customization to match your business’ colors and branding. This piece uses proper 1/8th inch bleed areas to allow printing to the edges, for a more professional looking flier. If you are not currently a RockPointe Marketing member and would like to learn more please visit http://rockpointemarketing.com/ . As a paid subscriber you will have access to tons of useful information including many webinars covering a multitude of topics, customizable marketing pieces and much more. Visit www.RockPointeMarketing.com today to watch past webinars and download this new piece! Christian Vetter is the definition of well rounded. He graduated from Chaminade University in Honolulu Hawaii, traveled to Hong Kong, and toured Southeast Asia in pursuit of his passion. On a professional level he is an experienced photographer, videographer, web developer, graphic designer, and marketing director. He has worked for Honolulu Magazine, SqFt Commercial in the Cincinnati market, and operates his own virtual tour business in northern Kentucky. Christian operates CVFotografie, in his hometown of Covington, Kentucky, where he offers both Google Street View tours and RTV’s Fusion Virtual Tours.